Two brothers (Nathan Lane and Lee Evans) inherit a string factory and a decaying country home after the death of their father (William Hickey). After moving in, they learn that the house has historical architectural importance and is valued in the millions. However, they are constantly tormented by a mouse within the walls. 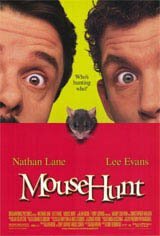 They engage in cartoon-like combat against the rodent, but it manages to outwit the brothers in successive situations.